Most organizations spend significant time and money on generating leads, but overlook the need to manage them. As a result, Lead Management often becomes a “black hole” between the marketing and sales departments. Understanding the differences between the separate and distinct stages in the Prospect-to-Customer Lifecycle and developing best-practice efforts around them is critical in creating a highly effective marketing program. 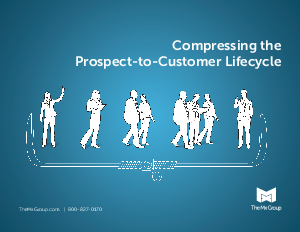 In Compressing the Prospect-to-Customer Lifecycle, you’ll learn how to define a process for qualifying, fulfilling, nurturing and tracking leads. You'll also be able to build a more information-rich marketing database, and ultimately realize greater ROI for your marketing efforts.